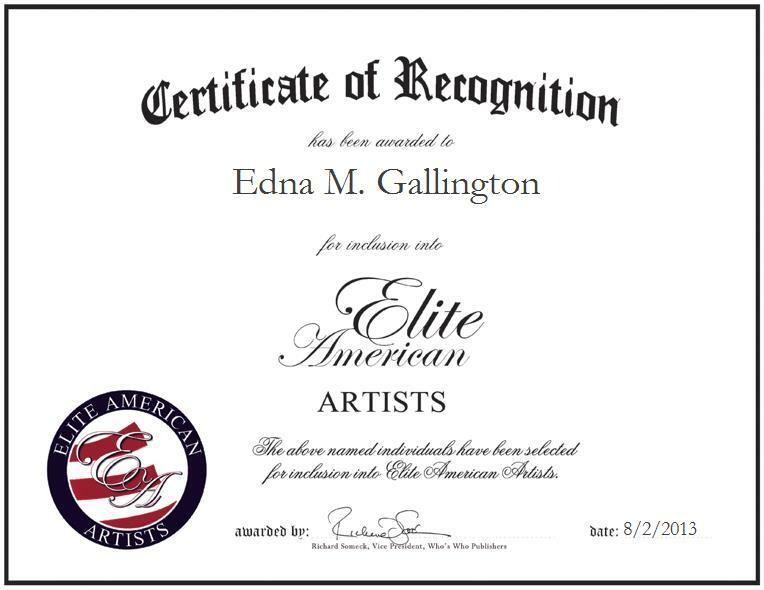 RIVERSIDE, CA, August 2, 2013, Author Edna M. Gallington has been recognized by Elite American Artists for dedication, achievements and leadership in writing. Ms. Gallington retired after a 30-year career in public relations for nonprofit organizations. She is a published author who wrote the book, “Watching From the Shadows,” which includes a black and white sketching of each woman by artist Elizabeth Bird Norton. During her career, she authored hundreds published interviews, news articles, and devotional material. She is currently working on a children’s book and a devotional book of short stories. Throughout her career, Ms. Gallington has written stories of people, interviewed them, and listened to their stories. She intends to write more books, but her first one is her treasure, as she sees life through their eyes, part fact and part imagination. Writing “Watching From the Shadows” has greatly enriched her life and taken her heart on a new adventure.” Other milestones in her career included writing an entire 12-page newsletter, at times directing a PR department, being a reporter on a mission trip, and planning and developing communication seminars. She is available for consultation in developing her retreat programs and speaking engagements.